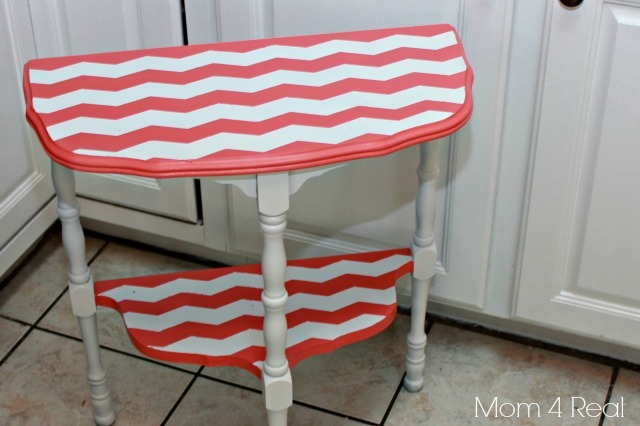 This past week, I decided to whip out one of my favorite new products that I brought back from Haven, and got to work on this chevron painted side table. This really was the fastest and easiest table I have ever painted, and I can’t wait to show you how I did it! 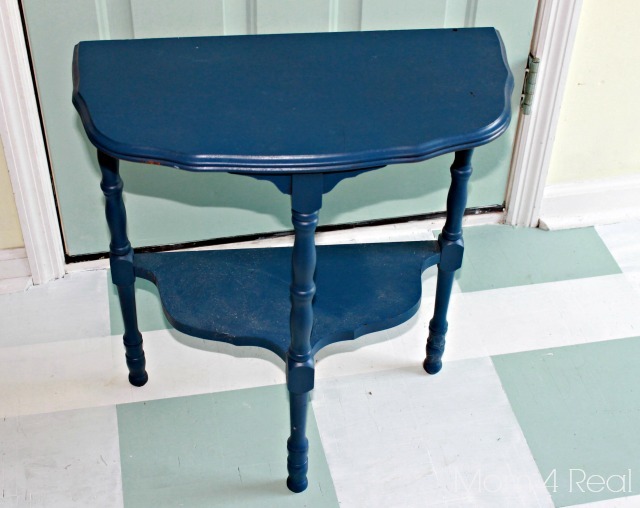 I started with this little blue side table that used to live in my son’s bathroom. He got a new shelf, and this little table has been living in our garage until I could find a new home for it. It was just too little and cute to get rid of. I decided to start by painting it white. 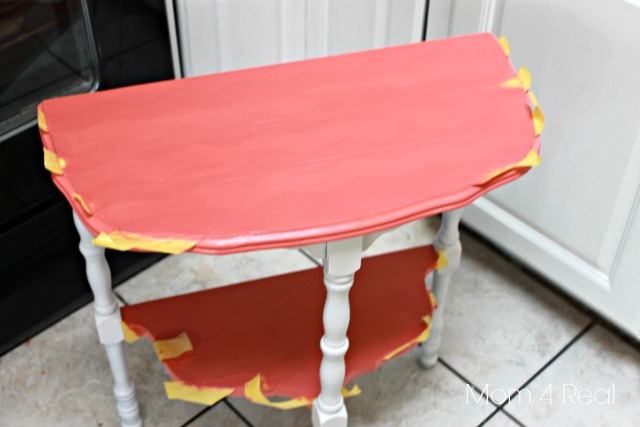 I would normally hand paint any furniture I was working on, but since this table was so small, I opted for spray paint. 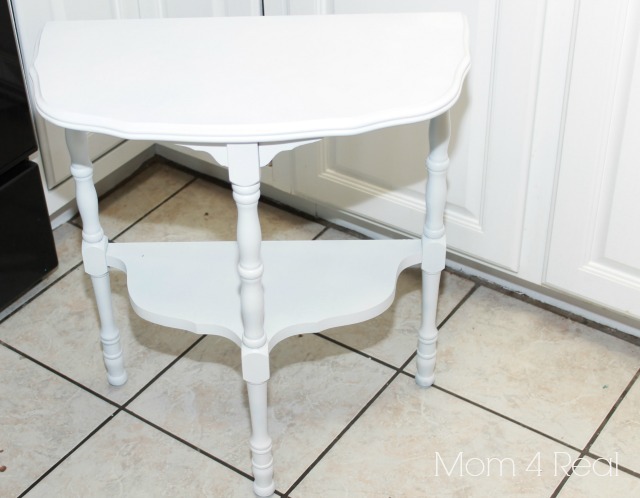 I used Valspar’s outdoor spray paint in white because that is what I had on hand. 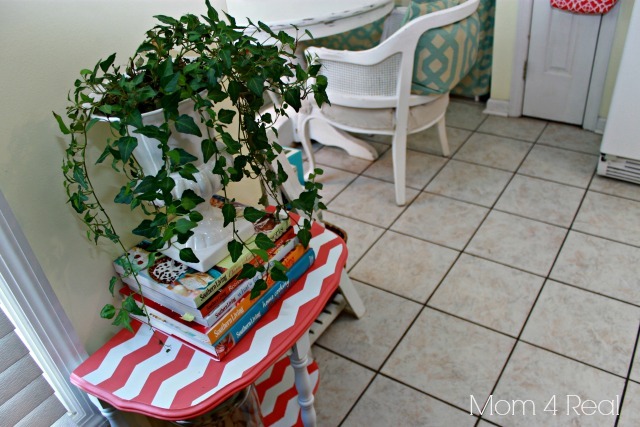 For the chevron pattern, I used a new product by FROGTAPE, Shape Tape, and the paint I used was a sample I bought on clearance at Lowe’s, Valspar’s Sonora Rose. I simply smoothed on strips of the chevron Shape Tape leaving about an inch and a half in between each row. Then I painted right over the tape, and around the top edge and the edge of the lower shelf. I removed the tape and squealed in delight!!! 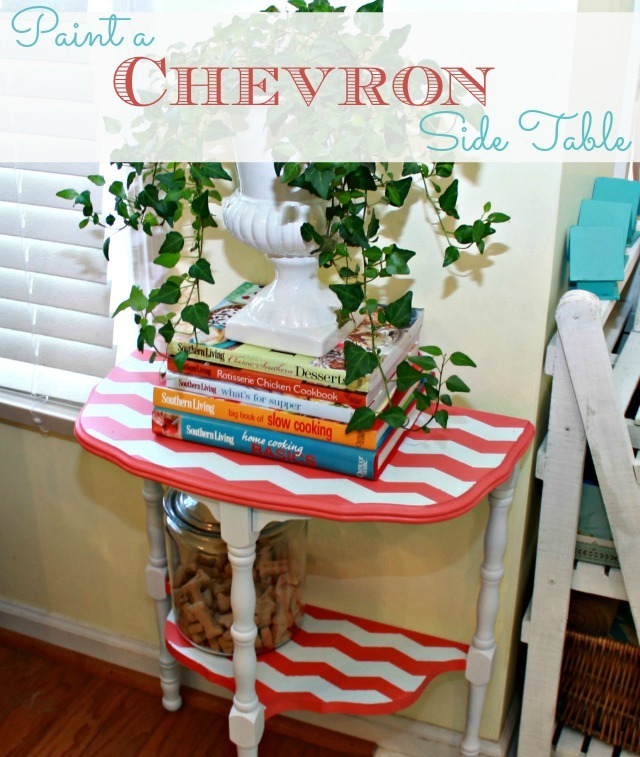 Chevron and coral together…be still my beating heart. 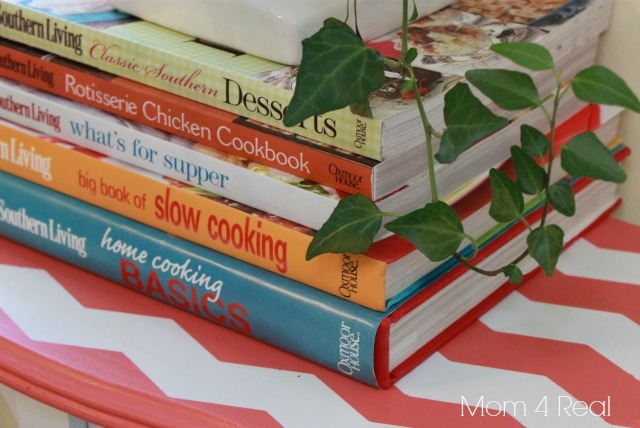 And now I have the perfect place to display my favorite cookbooks! So…what do you think? 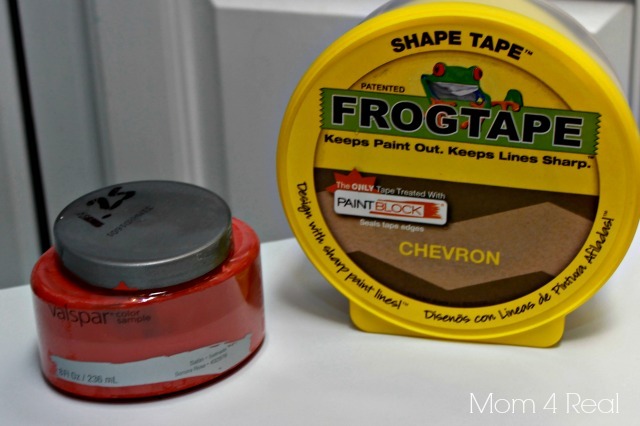 Want your own Chevron Shape Tape? Click the link below! « A Holiday Lamp Makeover Challenge With Lamps Plus! I think it is fabulous! Gotta get that tape! Ah! I didn’t even know that tape existed. So exciting. Need to get my hands on that :) Love your gorgeous table- the colors are amazing!! Holy smokes! Just what I’ve been waiting for (simply because I’m too lazy to do it the hard way)! LOVE how this turned out! That red pop of color is going to look fantastic no matter where you put it! Where’d you find the tape, Jess? Hey Miss Laura! I found it in my swag bag at Haven, but saw it last week at Lowe’s! Hey girl…added an amazon link because people are having trouble finding it…just in case! I have seen it at Lowe’s…we don’t have a Menards here, but I would totally call them and ask if they have it…good luck! This looks great! I got some of that tape too….waiting for just the right piece. 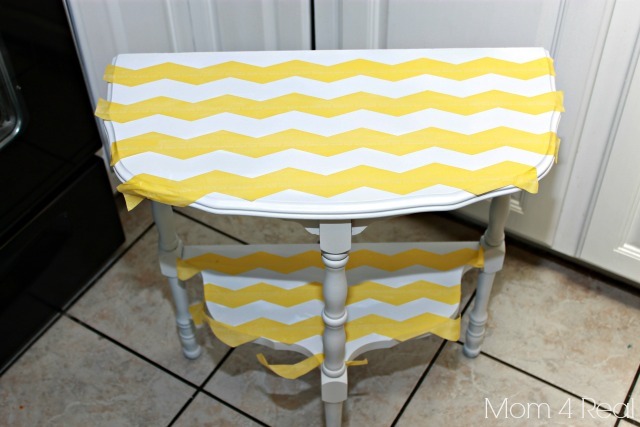 I have GOT to get me some of that tape…………it will make painting a chevron so much easier!